The iOS 9.1 update activates the News app for users in the U.K. and Australia, users and Apple itself confirmed on Thursday. Content for the U.K. launch includes the BBC, The Times, The Sun, The Telegraph, The Guardian, and the Financial Times, as well as magazines from publishers like Haymarket and Conde Nast, Apple told TechCrunch. This is on top of the material already present for U.S. readers. It was not immediately clear which Australian publications were on board. 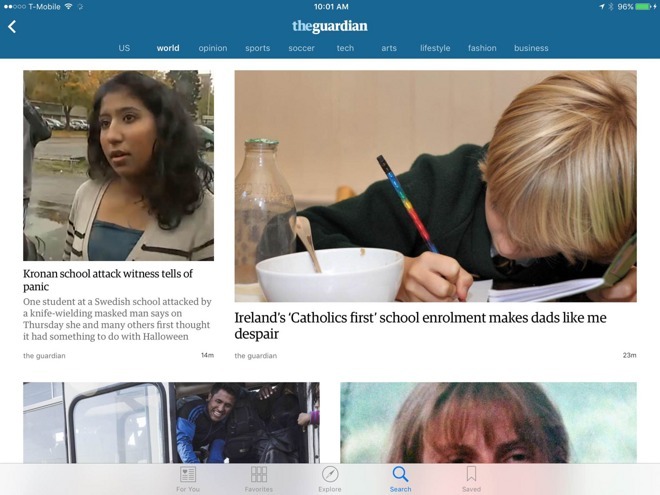 The News app is a replacement for the Newsstand feature in iOS 8 and earlier, which simply gathered together select apps in a shelf motif, with behind-the-scenes work done to allow background downloads and notification of new issues. By contrast, News is essentially a Flipboard-style RSS reader, allowing users to browse through multiple sources at once and see stories presented in a magazine-like format. The app will also let users track stories on specific topics, such as space exploration. iOS 9.1 is otherwise a relatively modest update, mainly adding new emoji, and compatibility with the iPad Pro and fourth-generation Apple TV. When shooting Live Photos on an iPhone 6s or 6s Plus, the OS will now detect when an iPhone is being raised or lowered and skip recording those motions. Recently it was revealed that Apple is actively blocking News within China, even for readers simply visiting the country.